Each year thousands of Christian worshipers from all over the world come and pray at the Chapel of the Miraculous Medal. They come to find hope, pray for their redemption, or seek a miraculous healing. But the medal has also attracted legions of the curious, relic seekers, and enthusiasts of odd religious iconography. The religious significance of the medal is due to reported impromptu visitations by the Virgin Mary in 1830, the first and last ever recorded in the French capital. 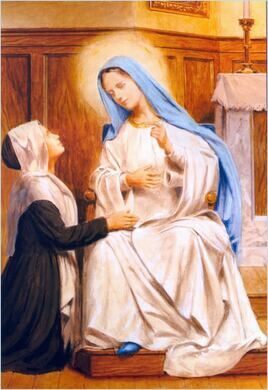 The two Marian apparitions were witnessed by Catherine Laboure, a young countryside nun who was freshly enrolled in the Daughters of Charity after a dream visit by Saint Vincent de Paul. 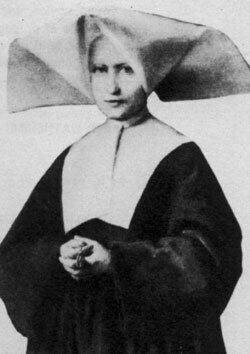 On Saturday, November 28th in 1830, Catherine confessed to her Chaplain that the night before, during her evening meditations in the church, she was interrupted by the unfamiliar “froufrou sounds of silk” coming from the ambon – a raised platform leading to the holy doors in a church. When she turned to see where the noises came from, the Virgin Mary surprised her by standing in the air, surrounded by an oval frame, dressed with an “auroral white silk robe” and standing on a floating globe. As Catherine reported it, the apparition, like a technicolor light show, morphed into a shifting composition mixing sacred hearts, immaculate conception symbols, neon-colored rotating circles, gleaming Stars and holy cross…. The Blessed Virgin asked that the psychedelic tableau be the design of a medallion that will bring “great graces” to whom will wear it. The oblong medal was then commissioned by the Church to French goldsmith Adrien Vachette, and two years after Mary’s surprising jewelry request the Miraculous Medallion became a popular Christian charm, converting the profane and producing miracles. One of the miracles it worked was for the Church treasury by being the most sold by-product of the religious regalia catalogue. One might call the medal a sacrilegious commercial success: millions of them are made and sold each year in churches’ gift shops, and sometimes in vending machines. No pilgrim who visits the Chapel leaves without their silver souvenir. The craze for the medal became so great that the Church felt at one point the need to clarify that the Miraculous Medal was neither a bauble nor a lucky charm, but in fact a holy artifact. Going to the Chapel is also a very unusual stroll into the realm of Christian fetishism and sense of spectacle. The always crowded sanctuary is brightly decorated with blue, white and gold, colors of the Virgin Mary, a very specific atmosphere trying to recreate an immersive experience of the Holy Manifestation. It contains numerous unusual relics: a comfortable armchair where the Madonna, no doubt exhausted, sat and chatted for two hours with Catherine during her first apparition. 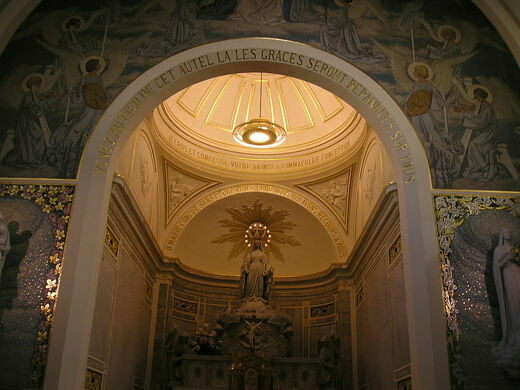 Beside the flamboyant effigy of the Blessed Virgin, one can see two glass vaults flanking the Choir that contain the “incorruptible remains” of both Sainte Catherine Laboure and Louise de Marillac, founder of the Daughter of Charity. 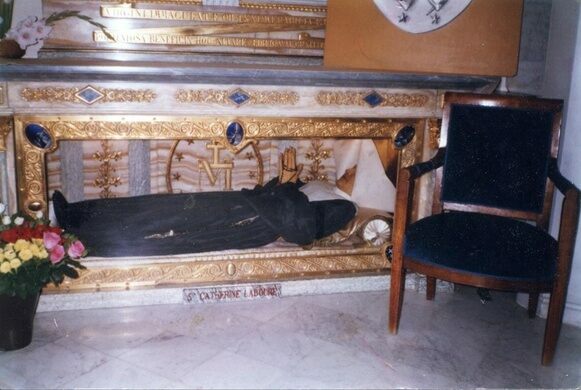 Both of the remains – or what’s left, presumably skeletons – are covered by wax representations of the saints and dressed in their vintage nun habits.